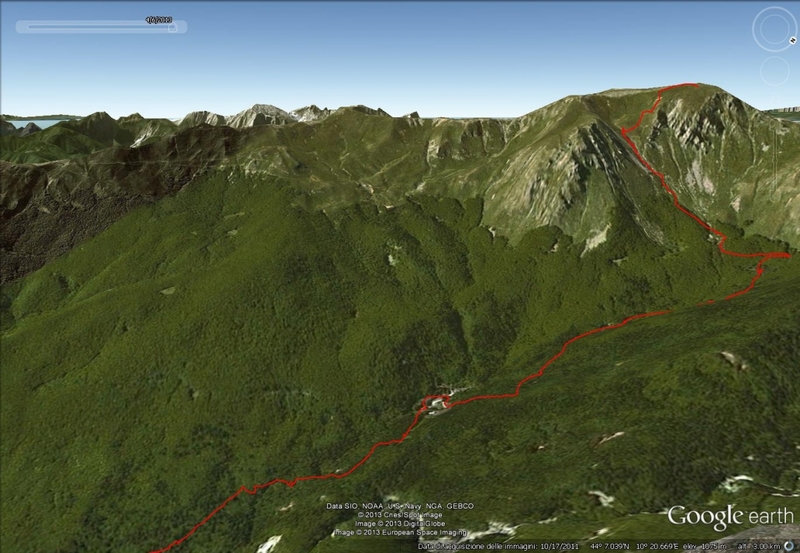 Demanding itinerary because of difficult orientation, length and difference in height, it gets the highest summit of Tuscany (Centre of Italy) – Prado peak 2054m and It has as successful completion the “Clessidra” couloir descent in a very interesting environment. We started from da Case di Civago (1046m) putting on our skis immediately; since there is enough snow coverage and above all an exceptional plenty of water in Dolo stream, we preferred to follow path number 605, instead to pass through Leonardo shelter, in order to be able to cross the stream using two bridges. We got in that way Abetina Reale alpine hut (1410m), 1h45′. After that, we kept following the path 605 towards Lama Lite and at about 1585 m (height) we diverted turning left heading the entrance of Clessidra couloir 1h30′ (3h15′) where we found a lot of snow 150-200 cm; its typical narrow passage looks wider then usual because of the snow height. Fortunately from a lateral couloir snow has already slided. We went uphill, at the beginning with a fair visibility then, in the upper part, in a thick fog and we got to Prado summit (2054m) 1h15′ (4h30′). The descent was acceptable, crusty and a bit heavy snow but skiable. Coming back we followed the same route, weather was getting worse and we did the last half hour with light rain (2h 10′ from summit). 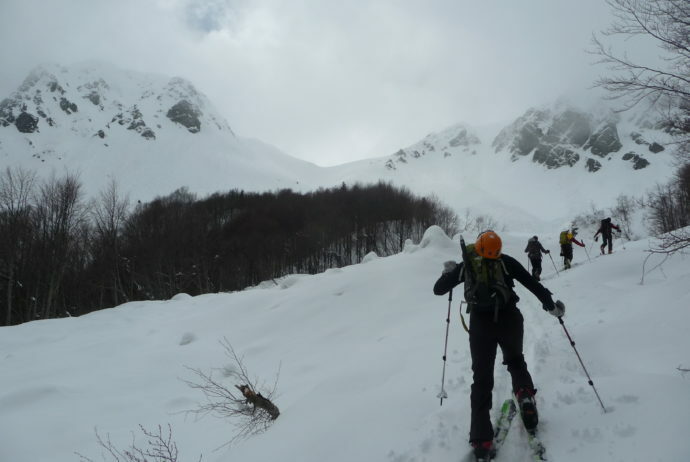 Raid did on 6th Apr 2013 with Ski touring Group “A. Bafile” Italian Alpine Club of Florence.